Limited quantities of the First Edition Hardbound version still available. I am happy to announce the resurrection of my favorite book, Landscapes of the Spirit, in digital form. It has been out of print for many years. When the original book was produced, I had the pleasure of having full artistic control over the selection of photographs and text, and therefore I feel that it is the strongest creative statement of my work available. When the book was published in 1997, there were few books being published where the artist had control of the digital files used for reproduction. Today, I have much greater control over the photographs for Landscapes of the Spirit - Digital Edition. High resolution scans have been made of all images, and master Photoshop files created that bring out their full potential. From the original file, I added the upgraded image files to the Adobe InDesign master file and created a PDF that contains the complete book, text and images intact. The final result is that I have the same book I love now available for download. The quality of the images really comes to life on screen. I realize that this isn’t the same tactile experience of holding a book in hand, but it is hard to dismiss the vivid quality one can enjoy on screen. 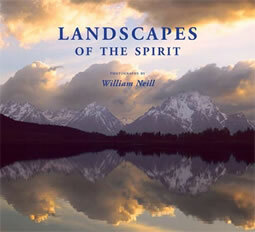 Landscapes of the Spirit - Digital Edition is delivered as two PDF files. One PDF contains single pages, and so is optimized for viewing the individual images, as well as for reading text. The second PDF shows the two-page spreads, allowing you to enjoy the book as it was originally designed. The ebook also offers interaction between each image and the Photo Notes section at the back of the book. Click on an image, and you are taken to the PDF page where the Photo Notes are for that photograph. When viewing the Photographic Notes, simply click on the photograph’s title, and you are linked back to that image in the PDF. The file sizes of my PDFs have been optimized to preserve the high quality images files, but they don't take any more time to download than an album from iTunes!